The Queen received The King and Queen of the Belgians at Windsor Castle. This is very exciting! 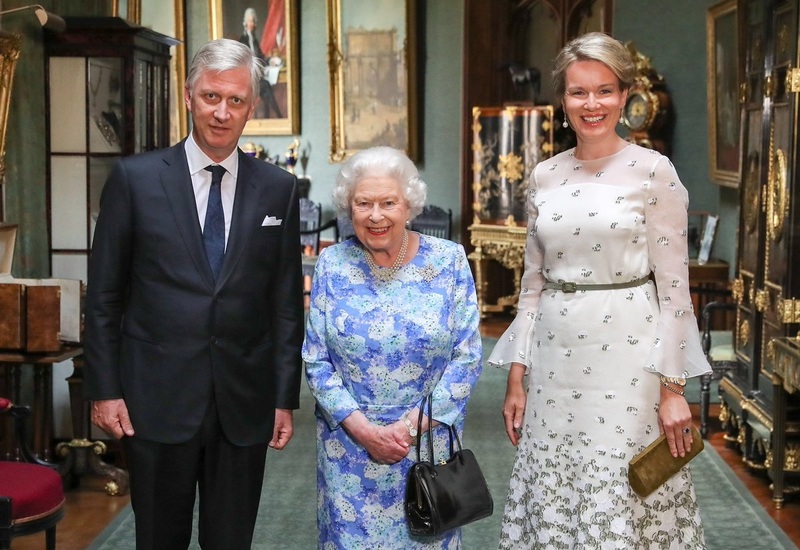 Both that King Philippe and Queen Mathilde swung by for a chat (they were in London for a ceremony commemorating Belgians fallen during World Wars I and II, which happened to place them in England on the day of the Belgium/England World Cup match), and that this marks an eagerly anticipated brooch debut. It's the Sapphire Jubilee Snowflake Brooch! A special gift from Canada presented to Her Maj last year and one I, like many of you, have been eager to see in action. 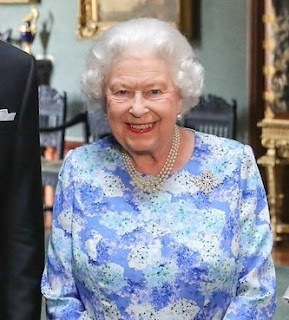 These patterned dresses do a number on brooch detail (we know that from 99% of her audiences); in this case, the blue at the center of the piece has practically disappeared. But it's perfectly sized to her preferences, and I hope it's the beginning of many appearances. As always, full info and more detail (including close ups) of the brooch can be found at the brooch link below.